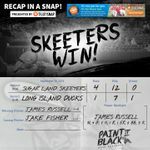 LONG ISLAND, N.Y. — The Skeeters won the Atlantic League Championship with a 4-1 win over the Long Island Ducks in Game 5 of the Atlantic League Championship Series on Sunday night at Bethpage Ballpark. Sugar Land Mayor Joe Zimmerman will be in attendance and will be making a proclamation in honor of the Skeeters’ championship. Also in attendance will be Incaviglia and numerous players from the team, along with ownership and front-office staff. Constellation Field Public Address Announcer Shane Brown will be emceeing the event.